If sequestration happens and nobody feels it, does it have a political impact? No, apparently; so two months into what we were told would be Armageddon, the Obama administration is launching a harm offensive, trying to punish the American people for suggesting Washington might modestly reduce federal spending. The weapon of choice? Furloughs of air-traffic controllers, deliberately imposing flight delays. The corrupt media is largely falling into line, blaming “steep budget cuts” for the flight delays. 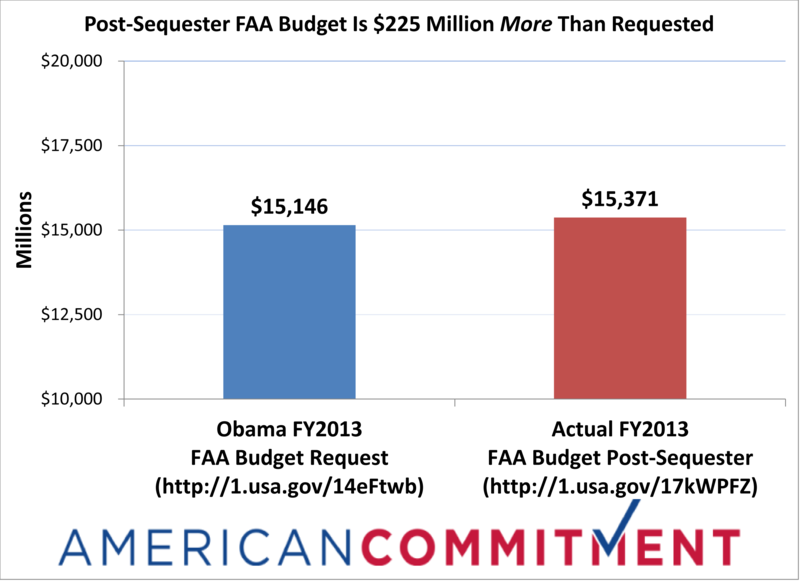 But President Obama’s original FAA budget request for fiscal year 2013 was $15,146 million. Congress, knowing sequestration loomed, appropriated $16,008 million. From that, sequestration cut $637 million; so this year’s actual, final FAA budget is $15,371 million. That’s a cool $225 million more than Obama’s original budget request. So why can’t the FAA simply implement the original plan? Heck, they could even ask Congress to rescind the extra $225 million they don’t need – and use it for deficit reduction. But that would prove there is plenty of room to cut spending in the bloated federal budget. And the Obama administration instead insists on arbitrarily and artificially making spending cuts painful. The truth, which Obama’s own original budget request may have acknowledged, is that the FAA is overstaffed. Since 2000 air traffic has declined 23 percent, but the controller headcount has actually gone up. The FAA is not even doing a particularly good job at carrying out the charade. When FAA chief chief Michael Huerta was called to testify before the House Appropriations committee he blamed a lack of transfer authority between individual account for furloughs. “I don’t have the flexibility,” Huerta said. Now, as a factual matter he was wrong; Senators John Thune (R-S.D.) and Jay Rockefeller (D-W. Va.) recently reminded Huerta that he has transfer authority under existing law to move up to five percent between accounts. But let’s assume that’s just not enough. The jig is up on Obama’s ridiculous flight delay stunt. It’s time to stop playing games and admit that sequestration is nothing like the huge, savage spending cuts the president tried to scare the American people about. In fact, it’s only a small first step toward the much bigger cuts that are needed to limit the size and intrusiveness of the federal government. Obama needs to end the FAA harm offensive, let air travel get back to normal, and let sequestration go back to being the dog that didn’t bark. © Copyright 2013 Phil Kerpen, distributed by Cagle Cartoons newspaper syndicate. Mr. Kerpen is the president of American Commitment and the author of "Democracy Denied."